Although I prefer long, illustration-filled instruction manuals when I'm paging through them while sitting on a comfy couch, I prefer shorter, more straightforward ones when I'm working up one of these posts. 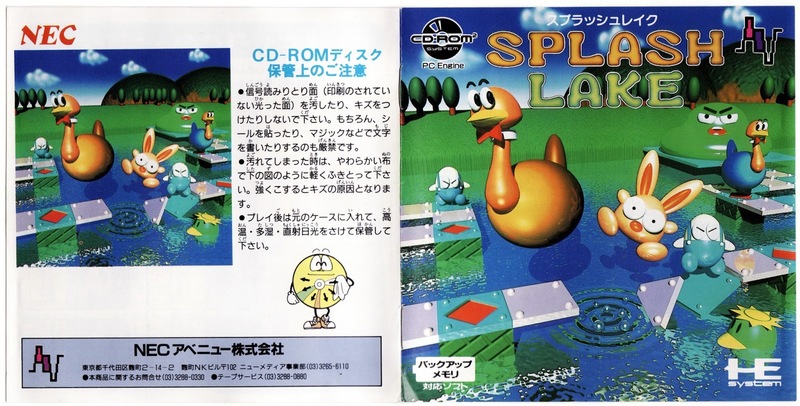 The focus of today's post--the manual produced for NEC Avenue's Splash Lake, an appealingly quirky, if a bit lacking in the long run, action-puzzler that was released for the PC Engine in 1991--falls into the latter category, as you'll quickly discover. Although I'd hardly call Splash Lake an amazing effort, it's far better than its rather questionable box art suggests it is. 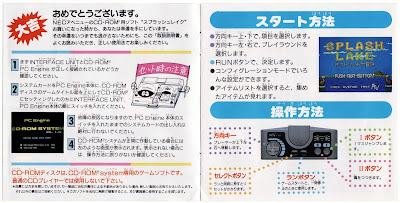 The first few inside pages of Splash Lake's manual aren't much better, it has to be said--although that cartoonishly rendered PC Engine and CD-ROM2 system on the left nearly makes up for it. 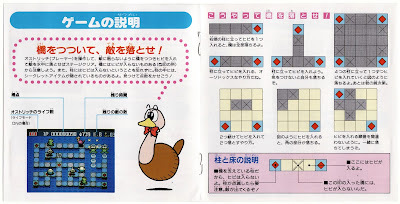 Things improve a bit on the next pair of pages thanks to the cute (and kind of creepy) rendition of the game's bow-tied-but-limbless ostrich. Mr. Ostrich (or, "Stumpy," as I like to call him) shows up on the last two pages of Splash Lake's instruction manual, too, only this time he's looking a little less chipper. 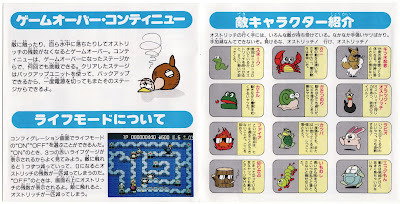 The same can't be said for the game's line-up of baddies, who take center stage just before the manual's curtain call. I especially like the sunglasses-sporting and cigarette-smoking tree stump, although his colorful cohorts are a pleasant enough bunch too.